It is snowing outside as I write. The powdered sugar flakes sifting down at an angle bring a smile and a sigh of relief. 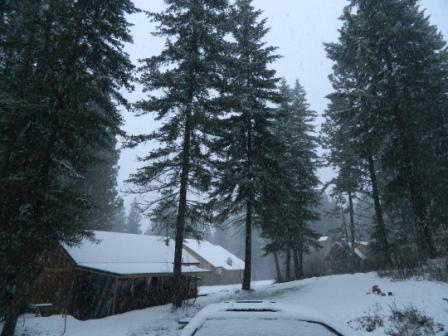 Snow is one of those things we pray for here at camp. 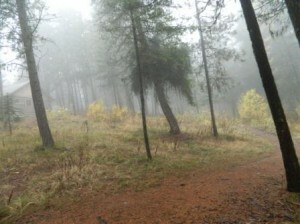 Will the snow come early enough in the season or late enough to cover those last few camps? Will we have enough snow to run the tube hill before that first rental group? Will we get a sufficient amount of snow to insulate the ground before we get a long cold stretch or will the pipes freeze again? One more thing we must give to God. We have been praying for snow and our Lord has graciously answered us with a beautiful storm and chilly drifts to soften and cover the ground. While I am out hunting for that last bicycle that one of the boys was sure he put away in October but I’m certain I saw down by the sports court, I will thank Him. This is just what we needed. Living at a Bible Camp means living on the edge, on trust and hope. Sometimes the power doesn’t work, sometimes the water inexplicably stops and Scruffy and Choco must run up the hillside to figure out what in the world happened with the well, sometimes the pipes freeze in the winter and that involves a whole lot of digging into frozen ground, sometimes there are forest fires in our area, and sometimes it is so hard to send those campers back to their broken homes that we are left zombified and empty of tears at the end of a summer, but God is so good. God has been gentle and steady and true. He has been taking care of Camas for 40 years and although there seem to be an awful lot of times that we are forced to trust Him because we are out of options and at a loss, sometimes I think this is exactly where he want us. Trusting in our Heavenly Daddy. It is His camp after all. The snow makes me smile, because it reminds me that He is there. Yes, there have been years that we had to bust out the paintball gear because the snow came late or melted early. But God understands what we need and is always faithful to bring it. The snow reminds me of His constant care and His love for us, the people of His hands. 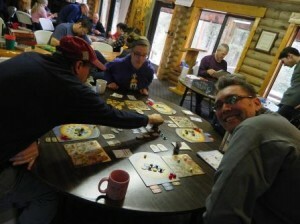 This week I want to share a few pictures that I took of our Fall CamasCon Board Gaming Retreat. A mysterious autumn fog drifting around Mt. Panther Cabin. First of all, I love the weather in the fall. The bright crisp mornings and the autumn leaves, the creeping mist that makes the woods look so mysterious and the pattering sound of rain on the metal of the lodge roof. 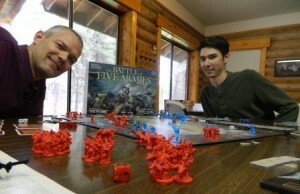 CamasCon Gamers enjoying an epic match up. Now on to the board game retreat. We had a good showing of gamers for the fall CamasCon and I managed to take a few pictures of games in progress. Enjoy. Strategy gamers pitting their wits and wills against one another…nicely of course. 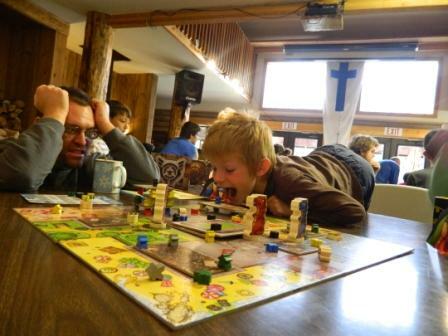 But Scruffy said never to even eat by the board games!!! Yep, Sweet Boy#3 is blowing on that board game! But this game is called “Rampage” and you are supposed to do that. The object is to blow over buildings and meeples with puffs of air and throws of the dice, because the players get to be rampaging Godzilla style monsters. A nice change of pace if your young gamer is having a hard time not bending the cards or throwing game pieces. This game is a license to destroy, which always goes over well in our household. 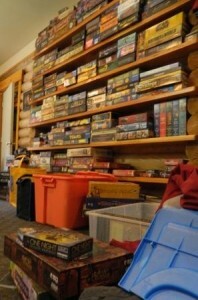 Yes indeed, Scruffy will have to haul most of those games back to their hallowed space on the shelf in our dinning room. But he is happy to do so if you will come and play some of them. And he will be doing it all over again come springtime. So until then, practice up, and we’ll see you at the Spring CamasCon in 2015!